Hurricane Ignacio passed through La Paz yesterday, and our Photos of the Day were taken by our old friend Boone Camp. 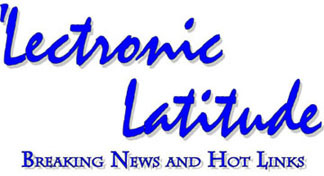 At this point NOAA reports that the storm is weakening quickly over the mountainous terrain of the Baja peninsula. Even if it reemerges off the west coast of Baja, the waters there are apparently too cool to allow regeneration to hurricane status. But as the hurricane approached La Paz on Sunday night and the future was uncertain, officials evacuated over 3,000 people, who spent the night in shelters. Winds topped 90 mph, but the extensive rain and flooding that was expected mercifully never occurred. The Red Cross reports no deaths or major injuries. 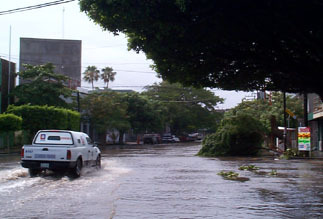 One car accident in La Paz was caused by excess water in the streets. 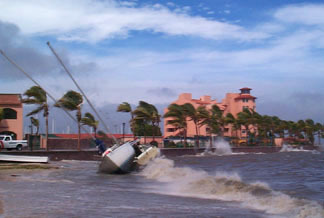 The wind came out of the north onto the bay, so a number of boats ripped loose and ended up on the shore or the rocks. At last report, only one boat was sunk in La Paz Harbor. Marina de la Paz says that there was a little damage to their outside docks, but no damage to their boats or dry storage. Boone reports this morning that the city is still suffering sporadic interruptions in electricity and water, and lots of trees are down. All evacuees have returned home, save for about 400 folks who live in shacks or dangerous, flimsy dwellings, and officials are taking care to see that they are fed and well cared for. Hurricane Ignacio has been downgraded to a Tropical Storm and it seems as though the worst is over, and it wasn't so bad. Who is out making passages in the Pacific and what kind of weather are they having? The YOTREPS daily yacht tracking page has moved to www.bitwrangler.com/psn. Check out this guide to San Francisco Bay Navigational Aids: http://sfports.wr.usgs.gov/sfports.html. 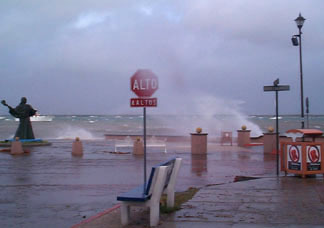 To see what the winds are like on the Bay and just outside the Gate right now, check out http://sfports.wr.usgs.gov/wind. The National Weather Service site for San Francisco Bay is at www.wrh.noaa.gov/Monterey. Looking for current as well as recent wind and sea readings from 17 buoys and stations between Pt. Arena and the Mexican border? Here's the place - which has further links to weather buoys and stations all over the U.S.: www.ndbc.noaa.gov/Maps/Southwest.shtml. The site for the Pacific Ocean sea states has moved to http://www.mpc.ncep.noaa.gov/shtml/PacRegSSA.shtml. For views of sea states anywhere in the world, see http://www.oceanweather.com/data.